As you guys may remember…we’re going to try to take first place on the Top Webcomics site. So this week especially…I’ll be creating all new desktops for you. I’m starting off with a Nastajia desktop. Click the image below and vote to get it. Now…the question is…WHO WILL BE NEXT? I’ll make the desktop based on majority votes. So have fun and post your vote. Please vote, though. Whether you want this desktop or not. It helps us get more readership…and it doesn’t cost anyone anything. As you guys know by now…I don’t like to ask for much. I have no donations button. And I don’t even run the store any more (IDW does now). But 900 pages in…I want to make sure we don’t hit a plateu with our readership. I want to keep bringing in new readers and never get lazy with this part of running a webcomic. This is something you all can help with. Anyways. Thanks for all the well wishes on Page 900. And let’s have some fun on our way to 1000…and beyond. 900 pages! Yippie! You’re doing a great job. A desktop I would be interested in is a background scene of one of the major cities. I’m always impressed with the quality of those. poor Alexander, can’t float through his life any longer. These Nastajia/Alex scenes are adorable. Also I’ve tried to get my friends to read this. Dunno if they do. But I found out about it through a friend so the word IS getting spread. ^_^ Thanks for making this comic. Can I have a Wallpaper of the Princess in her new outfit?? Please! I’d like to see a drawn wallpaper. I liked the way the concept art was drawn. More great writing. Nastajia knows Alex can’t change overnight and just lets him know she’s there for him. Did anyone else notice the very unusual legs on these 2 centaurs? I’ve got a suspicion on what they will look like tomorrow. I’d like to see old Nic’ on his throne for a wallpaper. Preferably with enough light to actually see him (he was in the shadows when Alex visited the throne room). Love the way the story’s progressing. Dan: Hey! Why you so tired? You just took a long nap! Alex: Nap nothing! I just spent the whole time trying to learn to fly and having Nastajia chew me out! I’m thinking a shot of Nicodemus’ city – Astoria, I think – as the background. Either that or Nic himself. – Nastajia in her new outfit with the centaur village in the background would be awesome. As for wallpapers, I second Mifememo. I love drawn wallpapers. If that’s too much work, though, maybe a background that isn’t black, for variety? TWC – Currently #1 with 20 votes! You all stay up late, or get up very early, heh. 😉 Let’s stay there. Wallpaper. Kiwi and Paddington, like that one cell from when they were talking. You know, that one. Yeah, that’s it. Voted, and happy to do so! I think an overview of Ashendel with some surrounding environs or Astoria or maybe even Gardenia would be nice. Or hell an overview of the whole of Dreamland!!! Or maybe one with Alex centered between his friends/landscape in the waking world on one side, and his friends/landscape in Dreamland on the other – and his clothing sort of half and half, blurred roughly down the center. (You’d probably have to do it in Photoshop). Meanwhile, today’s page is wonderful too; almost no action, almost no dialog – but still very affecting and effective. Thanks for the nice wallpaper, and congrats on the milestoneâ€¦ your dedication to this comic is awe-inspiring. I like the current arc! Am I the only one who thought of the Zelda animated series when reading the sentence “Excuse me, Princess.”? Or maybe I’m just biased. I really like the expression no Alex’s face in the first panel (and that even though I said I’d prefer a non-angsty Alex, how odd…). I also like the whole atmosphere and feel of this page. So serene and almost cathartic compared to the rough ride on the last few pages. As for the vote: I would love to see a full body version of Nastajia in her current outfit in front of a nighttime centaur village. Or something like that. And I agree with Mifememo and Zilen – a 2D art wallpaper would also be nice. I can’t see if there is a poll or not – maybe one of my ad blockers is blocking it. Me and my friends are at your side! Also: Maybe Dreamland/Earth Alex slash desktop would be nice, you know on one side there’s Alexander hanging for his life on the falling zeppelin and on the other side he’s sleeping in a weird pose snorting, or something like that. Nicodemus. Show the dragons some love. Ha ha. I thought the centaur was calling Alex a princess. So far it looks like Nastajia in current outfit, hand drawn characters, and Astoria are the most voted on. I’ll keep watching and have to pick something in about 12 hours so I have enough time to create the next desktop. Don’t forget. Once today’s done…this desktop will be gone FOREVER! Concept art of Alex and Nastajia in relaxing outfits! I like the one Nastajia’s in now, but Alex needs to be out of that armor! I run at 1900×1200 too. But I checked and the majority of resolutions viewed by you all is 1280×1024. I DID make some 1900×1200 ones before. I think they’re on my DA site…if anyone’s interested. I think a nice desktop would be a “family photo” type picture of Alex, his brother, and their mom. It could be from either “present” time, when the boys are grown, or from the flashback time, when they were still young. At first I thought the centaur said “Princess Alexander” and I was like WHAT? Maybe you should put a Nastajia after the princess? Or switch em around. I agree with Francesco, and vote for MORE COWBELL…err more Nastajia! Maybe I’m colorist(? ), but Kiwi’s skin tone puts me off somehow. My vote is and always will be until I get it … the Teddy Bears!!!!! Vote: Nastajia in current outfit with Alexander. Alex, thinking: Blast you, you centaur! I wanted more cuddle time with Nastajia! And don’t call me Shirley, I mean, princess. (Leslie Nelson, you are just too funny). On a lighter note, I vote for the centaur village with Stajia in her current outfit; I like princess of the elves, but this one she has just makes her look divine. #1!!! YEAH! THAT’S WHERE YOU BELONG, SCOTT!! WOOOOOOOOOOOOT!!! Great page, today! Feels good when the characters have these quiet times, ‘takes note’. 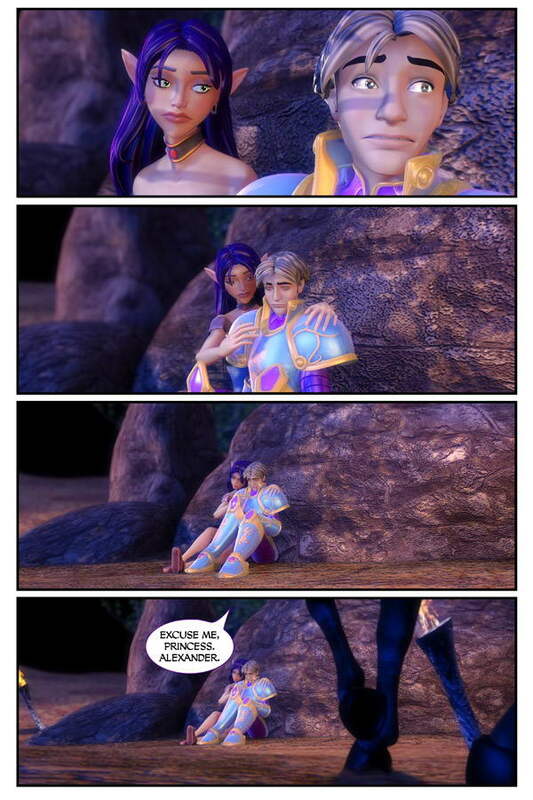 Isn’t it true that these “awwwwww” moments are usually interrupted by business in most epic tales… Great transitioning. Oh, and hey! Both of my comics finally made it in the top 100! ‘pats self on back’. > A desktop I would be interested in is a background scene of one of the major cities. Iâ€™m always impressed with the quality of those. Ditto! Not an aerial shot or a general view of a city; Just a good close-up inside the actual city (of your choice), unpoluted with main characters 😉 It’s not that I don’t like them, but we get to look at them every page already! Besides, Stefano’s work is awesome and deserves to be admired! I agree with those calling for some kind of wallpaper based on both waking and dreaming Alex. It’s the focus of the comic, after all! 900 pages in, and loving this story. Also, I’d vote for a Felicity wallpaper. A dancing Paddington background. You know you want to. Just wanted to let you know. Twokinds is catching up. Oh and 1)Nastajia in current outfit, 2)hand drawn characters, and 3)Astoria FTW! New reader here (procrastinating heavily from tests: I have just read the entire archive). Awesome comic. Normally I don’t really like 3D comics, but yours has a lot of detail in it, and very good expressions. But mainly I really like the story. I’d vote again if I could, but that has to wait until tomorrow! Loving the scenes between these two! Oh yeah! The desktop of Nastajia is awesome! Nice wallpaper (and nice page, as always)! I don’t comment much, so even though she’s been wearing it for the past couple weeks, I need to tell you how much I adore Nastajia’s current look. Usually I spend more time staring at the more interesting but less classically-beautiful characters in a comic (Claudius from Xylia Tales has the best nose ever), but I cannot stop marvelling at how stunning she is in every panel. I think it might be nice to see either some of the cities or places for wallpaper or maybe something with the characters from when they were kids in the flashbacks. And, y’know, while you’re there, if you have an extra second, not that I wanna impose, but I’m in 511th place, lol . . .
awesome desktop image!! I want to see Kiwi next!! I was on topwebcomics and saw you up at #2! WOW! Dude, this stuff is intense. Forget the 1000, you’ll go OVER NINE THOUSAND!!! Both joking and serious there if you dont see it. Darn, we’re number two! Vote, people, vote! Alex sees the writing on the wall, Orion will provide the lessons and Nastajia will tutor. Sounds like a win-win situation to me. Well Done, Scott. we need like an m rated page for those wanting to get some real romance out of the two. That’s going to be Scott’s “retirement” project. I first read “Excuse me, Princess Alexander”.